3 | 272 students enrolled. 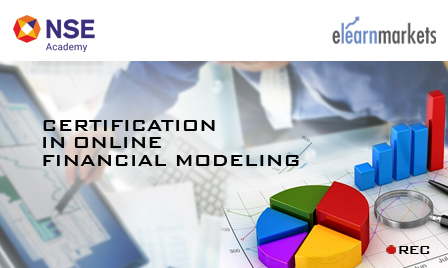 Certification in Online Financial Modeling course is jointly certified by NSE Academy & Elearnmarkets (NSE Academy is a subsidiary of National Stock Exchange of India). In today's world of extensive data where decisions are highly quantitative based, financial modeling has become an indispensable tool. It is the most sought after skill required in almost all sectors of the financial services industry such as banking, equity research , project management, commercial banks, etc. Certification in Online Financial Modeling is a course designed, keeping in mind the need to provide practical exposure to people who believe in the concept of long term investment and value creation. It is a science of building models to depict financials statements and investments.This programme has been developed to help the participants to understand the essence of the subject and simultaneously use this knowledge on “real-world” problems to construct consistent and realistic financial models. The Financial Modeling Training program is designed to offer students the intensive instruction and training needed to successfully compete in rapidly developing global financial markets. This course covers the fundamental theories and practices of valuation analysis, strategy analysis, prospective analysis, DCF modeling, trading comparables and transaction comparables. Modeling through Excel will make the learners confident enough to create their own financial model right from scratch. Learn Financial Modeling and be an expert in deriving company valuation!! Students enrolling for Certification in Online Financial Modeling Training programme will be given a “Certificate of Participation” from NSE Academy facilitated by Elearnmarkets.com, after successful completion of the course. Participants will also be given free access to related webinars conducted by Kredent Academy for further knowledge enhancement. An email query support, Question & Answer community platform can also be availed by the learner for any kind of doubt clearance related to content while pursuing the course of Certification in Online Financial Modeling. Working professionals to improve their job prospects in Equity Research field.